On these modest pages, you can read about Stockholm's four tram lines.  Route 7 is a heritage tramway, operated on a volunteer basis by the members of the Swedish Tramway Society. Djurgårdslinjen, as it is also called, runs for most of the year.  Route 12 was the only line that survived the abandonment of Stockholm's tram system in 1967. The Nockeby line still provides faithful service to the residents of Nockeby.  Route 21 (the Lidingö line) is actually a railroad, but since it's operated with trams, we've naturally included it here.  Route 22 the Cross-Connector, survived from the Dennis package of transportation improvements. 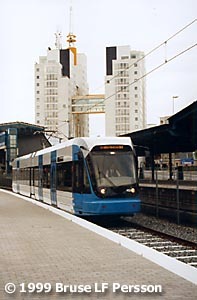 It runs outside of central Stockholm, connecting several major transfer points. The map shows the four tramwaylines in Stockholm. © All rights reserved. Alle Rechte vorbehalten. Copyright © 1998-2019 Bruse LF Persson  Stockholm Tramway lines is a part of tram.se  Produced by Pantograph.